Patellofemoral instability usually involves the patient having a sensation of their kneecap ‘slipping away’ or feeling loose on a movement of the knee. It can occur through a number of anatomical or genetic causes, or it can result from a previous patella dislocation injury. Here we explain both primary and secondary instability. Patellofemoral instability or kneecap instability may be associated with pain and swelling in the front of the knee and can be classified into two main groupings; primary instability and secondary instability. This type of instability can evolve from a number of different mechanisms, such as lax or over flexible ligaments around the knee. 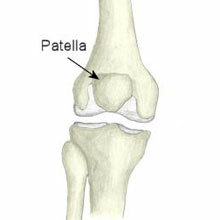 The location of the patella is too high within the knee joint which is known as patella Alta. The tibial tuberosity which is a bony prominence at the front and top of the tibia bone may lie anatomically towards the outside or lateral surface of the tibia or shin bone. Non-surgical – If the knee is swollen and painful a knee extension brace can help to immobilize the knee. Quadriceps strengthening, in particular of the VMO (vastus medialis obliquus) muscle, may be advised. Patellar taping techniques may provide help in facilitating correct patellar tracking. Surgical – In some cases surgery may be needed to correct the alignment of the patella. This may involve; Lateral release of retinaculum and other muscle fibres VMO tendon advancement Tibial tubercle transfer. This condition results from a primary knee dislocation. The medial patellofemoral ligament is the main stabilizer of the patella in preventing the patella from shifting laterally. During a patella dislocation, this structure may be severely compromised resulting in patellofemoral instability. The same treatment principles apply for secondary patellofemoral instability as they do for primary instability. If the knee is swollen and painful a knee extension brace can help to immobilize the knee. Quadriceps strengthening, in particular of the VMO (vastus medialis obliquus) muscle, may be advised. Patellar taping techniques may provide help in facilitating correct patellar tracking.